Under the leadership of Karissa Kruse, the group moved to end organic meetup groups, where growers could learn about organic viticulture on vineyard visits to various Sonoma organic vineyards. 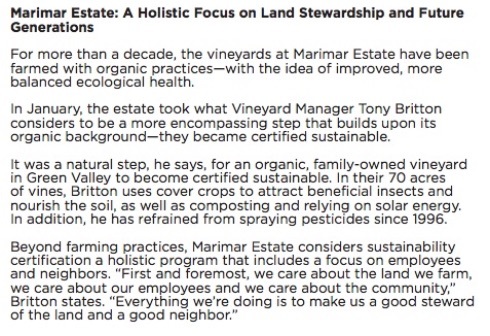 The county’s winegrowers are promoting what some would see as deceptive storytelling in the group’s latest Sustainability report’s feature on Marimar Torres’ “organic practices.” That winery began using synthetic herbicides and fungicides in 2013. 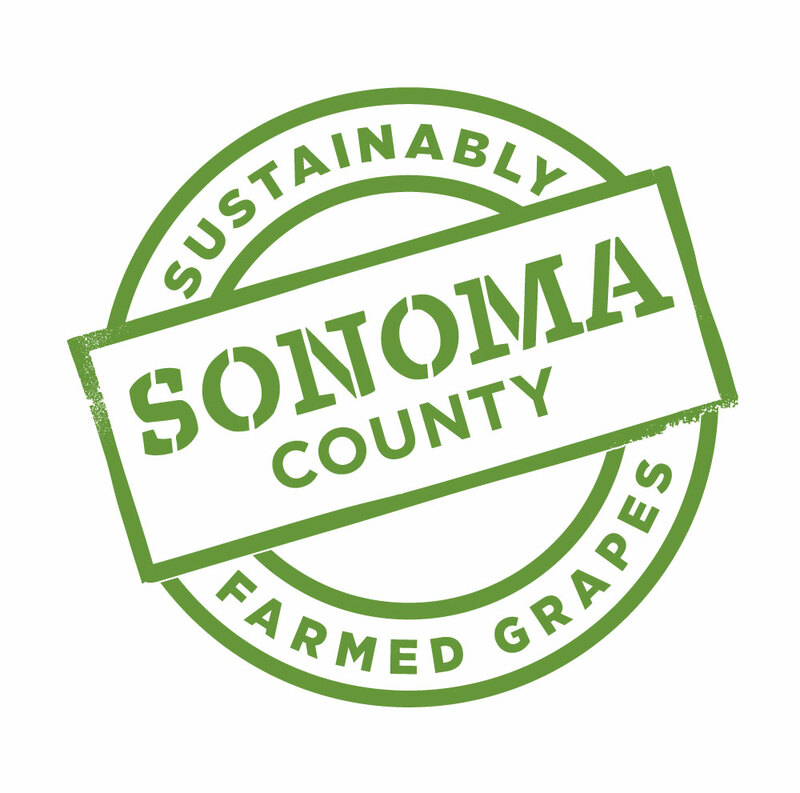 The Sonoma Sustainability group does not call upon growers and vintners to use one set of standards in order to be listed as “certified sustainable.” It says that winegrowers can use any of four different programs – CSWA, Fish Friendly Farming, Lodi Rules or SIP, but it doesn’t post which program each “certified vineyard” has been certified by, thereby making it impossible to understand what chemicals, if any, are prohibited. Steve Dutton, a prominent grower who is the president of the Sonoma Farm Bureau (and whose brother Jim heads up the Sonoma Winegrowers), uses vineyard chemicals that are prohibited by the CSWA standard in the family’s vineyards – Mancozeb -, but since it turns out that only the Dutton winery – not its vineyards – is certified, the CSWA vineyard standard doesn’t apply. Could that be confusing to consumers? Furthermore, the winery says it’s going to be labeling its wines as certified “Sonoma Certified Sustainable,” but what does that mean? How can consumers know what’s in the bottle? I remember attending one of these at Preston Farm & Winery, back in the day, and a lot of of good information was provided and great questions were asked and answered. There were shared lunches, and a lot of learning took place in a comfortable environment. Today Sonoma has fewer than 2 percent organic vines, compared to Napa with 7.3% certified organic vines. Napa’s Growers proudly sponsor the country’s only organic winegrowing conference, which takes place every other year. The Sonoma organization ditched the organic meetups; now all meetings focus on sustainability. Does this mean that Sonoma is deliberately squelching organics? No. Does it show leadership and support for organics? No. Sonoma’s Sustainability Greenwashing: How Misleading Can It Get? “For more than a decade, the vineyards at Marimar Estate have been farmed with organic practices—with the idea of improved, more balanced ecological health. In January, the estate took what Vineyard Manager Tony Britton considers to be a more encompassing step that builds upon its organic background—they became certified sustainable. It was a natural step, he says, for an organic, family-owned vineyard in Green Valley to become certified sustainable. In their 70 acres of vines,* Britton uses cover crops to attract beneficial insects and nourish the soil, as well as composting and relying on solar energy. In addition, he has refrained from spraying pesticides since 1996. In reading this, would you think that Marimar Torres is either certified or “practicing” organic today? In his comment about pesticides, Britton is apparently saying he doesn’t use insecticides, which may be true. But he does use herbicides and fungicides (that are not organic). Cover crops and composting are part of sustainable as well as organic farming. More than half the wineries in the state use cover crops. Though Marimar Torres was formerly certified organic on its Green Valley vineyard in 2003 and later its Freestone vineyard, the winery gave up on organic practices and started farming with chemicals that are prohibited under organic certification on its Freestone vineyard in 2013 and on its Green Valley property surrounding the winery in 2016. The winery has surrendered all of its organic certifications – and it has stopped being organic in its practices. None of these is permitted under organic certification. So why would using genotoxic substances (like Roundup) be a good thing to use? Genotoxic substances affect one’s DNA. In short, this is not a story about sustainability certification complementing an organic vineyard. It is a story about a winery that was formerly organic deciding to use the more toxic agrochemicals and THEN switching to the lower standard on agrochemicals – sustainability. I fully support sustainability’s efforts to reduce inputs and make growers and wineries more efficient but painting a portrait like the one here is misleading and deceptive. Marimar Torres stopped being organic. Then she decided to be sustainable. Elsewhere she has been quoted as saying consumers don’t know the difference. Sonoma Certified Sustainable? Consumers must read the fine print very carefully. 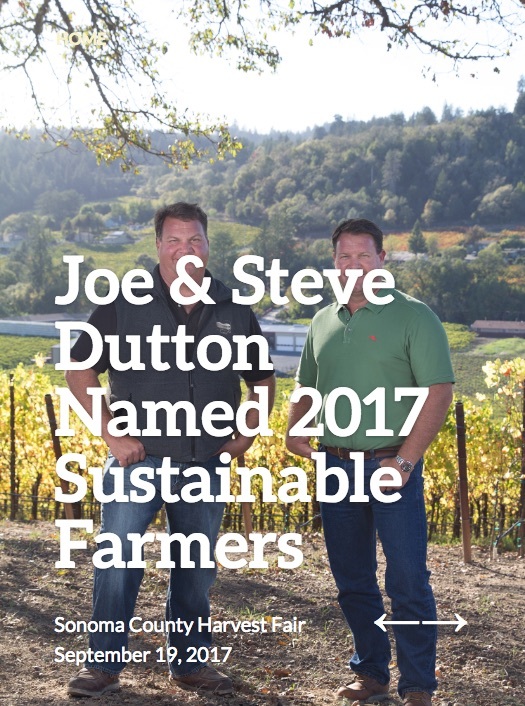 Joe and Steve Dutton were awarded the Sonoma County Harvest Fair’s top sustainability award in 2017. 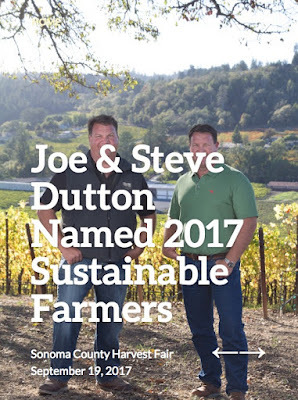 Dutton Estate Winery’s sustainability page declares that the winery is “an active participant in the California Sustainable Winegrowing Alliance (CSWA) and has been certified since 2016.” Dutton displays certified sustainable signs on his property. Under the CSWA’s guidelines, CSWA certified vineyards may not use a list of prohibited chemicals on what it calls the red list. Mancozeb is one of the red list chemicals. Dutton’s vineyards appear on the Sonoma Sustainability list of certified vineyards. According to Steve Dutton’s Pesticide Use Report, submitted to the county ag commissioner and the state of California, Dutton has been applying Mancozeb and continued to use it in 2017 and in 2018. Pesticide Action Network classifies Mancozeb as a Bad Actor and categorized it as a carcinogen, a developmental and reproductive toxin and a probable endocrine disruptor. The fungicide is also highly toxic to fish. The National Academy of Sciences in 1987 urged the EPA to ban Mancozeb, calling it one of the most potent carcinogens in agriculture. Mancozeb is an old school fungicide that has been widely phased out in vineyards. In 2016 in Sonoma, wine growers applied 881 pounds over 313 acres. But, come to find out, Dutton’s vineyards are not CSWA certified. Only his winery is. So the Mancozeb prohibition doesn’t apply to Dutton. 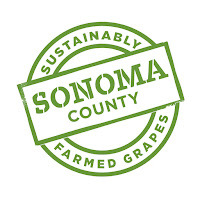 Sonoma Certified Sustainable has a mix and match system of sustainability certifications. 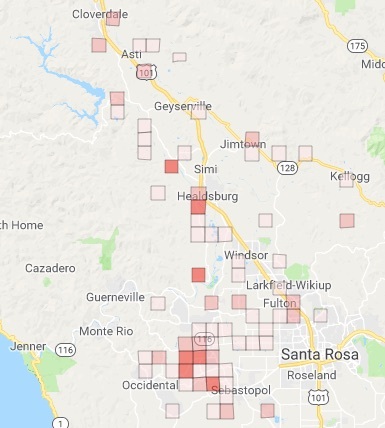 The Sonoma list of “Certified Vineyards” includes wineries that have received “third party certification from California Sustainable Winegrowing Alliance (CSWA), Fish Friendly Farming, Lodi Rules or Sustainable in Practice (SIP).” But the Sonoma list doesn’t say which type of certification each vineyard received. It turns out that the Dutton vineyard certification is for Fish Friendly Farming (FFF). Is Mancozeb prohibited or permitted under FFF guidelines? Laurel Marcus who heads up the FFF program says growers should use alternatives to Mancozeb. “Since it has a high toxicity to aquatic life, we would require they look for a different, less toxic product,” she said. Yet, if you, as a consumer (or even a wine professional), try to understand these standards, you might be pretty darn confused. Or if you consider Mancozeb or chlorpyrifos to be dangerous, you might not put them in the “environmentally friendly” category. The EPA initially moved to ban Mancozeb and had plans underway to ban chlorpyrifos until Trump was elected. (But last week a court ordered the EPA to ban chlorpyrifos within 60 days). Is that what the Sonoma Certified Sustainability movement wants consumers to know about its standards? If Sonoma winegrowers and marketers think people will respect the Sonoma Certified Sustainable green bottle label and possibly be willing to pay $1 a bottle more for it, that might backfire when consumers find out Mancozeb is being used. Note: A previous version of this post erroneously stated that Dutton’s vineyards were CSWA certified and therefore not in compliance with the CSWA vineyard standard. This post was revised and corrected Aug. 21 to reflect the fact that Dutton is only a certified CSWA winery and not a CSWA certified vineyard.